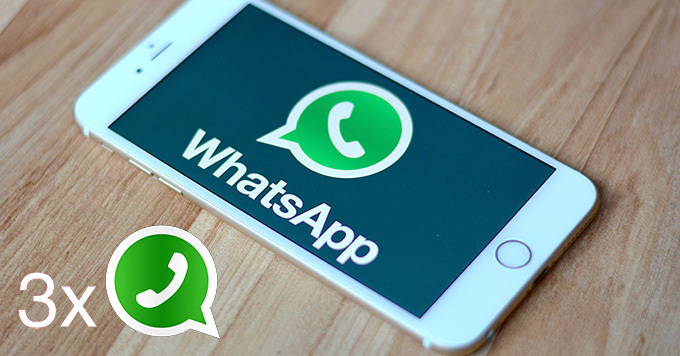 Whatsapp is a popular messaging app that is used by many smartphone users as a communicate tool with others. However, since most people need to deal with personal, business and other issues everyday, isn’t it more convenient if they can use multiple Whatsapp accounts on one phone for different purposes? However, the app will not allow that, for it only recognizes one phone number per phone. Regarding this situation, you can still seek help from third-party apps, such as the ones to be introduced below. MultiWhatsapp is an easy-to-use application. It can make as many copies of Whatsapp as you want in your Android phone with very simple steps. You don’t need to have your phone rooted to use it, which saves a lot of trouble. Moreover, you may choose a name for your new account by using this tool. Each duplicate that you make will also have its own settings and function just like the original one. 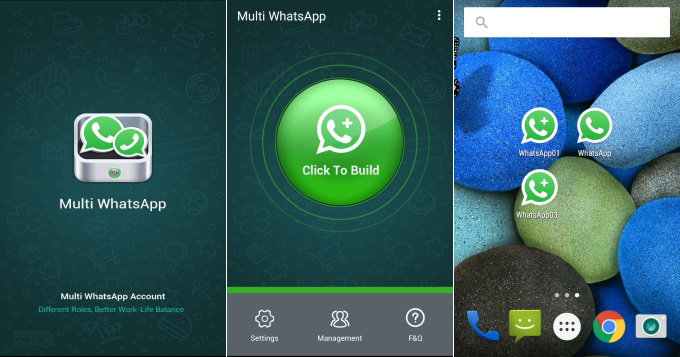 Here is how you run multiple Whatsapp on one device using MultiWhatsapp. Go to its official website. Download, install and launch the app on your Android device. On the app, click the “Click to Build” button and then indicate a name for the copy of the Whatsapp. Wait for few seconds and it will ask you to install the application. Just click “Install” and you now have your Whatsapp duplicated. You may now insert and activate your other account. Repeat these steps to create more Whatsapp accounts. In case that you want to manage or delete your account, just simple go to “Manage” tab and click on “Open”, “Install”, “Uninstall”, or “Delete” tab. 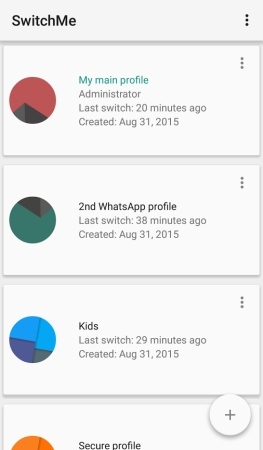 SwitchMe is an app that can help you make duplicate profiles on Android, which works the same as switching users on the computer. This tool is available to all Android phones. However, it is required that the device should be rooted for you to have multiple Whatsapp on Android. Also note that it needs the latest version of the Super User. Aside from Whatsapp, it applies for using two Twitter on one phone, and many other apps, too. Here is how you can make use of this application. Download and install the app on your rooted device. Launch SwitchMe and then grant the Super User that it will ask. Create a user profile on the app and that profile will serve as the administrator. In there you may find the settings, current apps and the Whatsapp profile installed on your device. Next, create your second profile by hitting the “Create Profile” button. Choose the “Switch” option to use the new account. Your phone will then restart and use the new account. Go to Google Play Store and download a new Whatsapp app again and register your other number. You may go through the same process on different accounts. Remember that in some cases, you’ll find the app crashing. If that happens, uninstall and reinstall the app from the Google Play Store. After checking out the two applications to manage multiple Whatsapp on Android, you may notice that the first one is more handy. For one thing, it doesn’t ask for root of your device. For another thing, the whole process is much simpler. What’s more, all the newly-created apps will be displayed on the phone screen, and you are free to open either one of them whenever you want.